Barack Obama was at Rice University’s Baker Institute on Tuesday night. 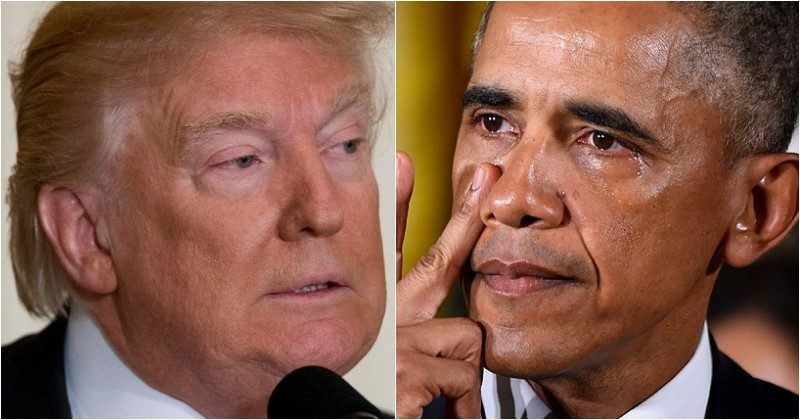 The former president claimed he was responsible for America’s surge to become the top oil and gas producer in the world, saying, “That was me.” The self-aggrandizing Obama made a critical mistake, and that put President Donald Trump on the warpath. Trump blasted the 44th president, showing him his future “behind bars,” and the mainstream media is reeling. You’ll love this. Barack Obama is demanding that Americans say “thank you” to him. Last night, the former president gave a talk at Rice University, taking credit for President Trump’s accomplishments. “I was extraordinarily proud of the Paris accords because — you know, I know we’re in oil country and we need American energy, and by the way, American energy production,” Obama said. Obama can’t stand it. The timing of his comments comes on the heels of President Trump telling a crowd in Mississipi on Tuesday that America is now the world’s biggest oil producer. In fact, Trump predicted way back in March 2018 that this would happen, and it has nothing to do with the Obama administration. It was President Trump who got rid of the Obama-era regulations on public land in February 2018, which cleared a path for expanded oil and gas drilling, reported the Washington Post. But the real issue on the president’s mind is the Mueller investigation. Just a few days ago Trump gave an interview where he accused Obama of treason. David Bossie and Corey Lewandowski, who both worked on Trump’s campaign, asked whether or not he believed Barack Obama knew that John Brennan, CIA Chief at the time, and James Clapper, then-Director of National Intelligence, were conducting surveillance on members of his campaign. Well, Trump had a response for Obama and his cabal of deep state rats. 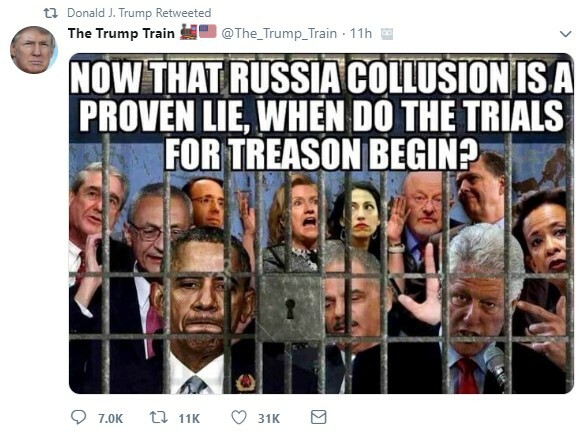 The president boldly re-tweeted a meme picturing these people behind bars: Barack Obama, Hillary & Bill Clinton, Huma Abedin, James Comey, former Director of National Intelligence James Clapper, John Podesta, and Loretta Lynch. It reads: Now that the Russian collusion is a proven lie, when do the trials for treason begin? The other big question is if Obama has all this time to run around the country campaigning during the midterms and now giving this talk at Rice University, where is his memoir which Penguin House paid a whopping $65 million dollars in advance? Michelle Obama finished her book a long time ago. She’s currently on an international tour promoting it. The answer is the former president can’t write his memoir. There is no doubt his team of attorneys has warned him he will potentially incriminate himself. Obama can’t discuss his last year in office. It’s becoming clear there is no way there was a major spying operation on the GOP candidate for president without his knowledge. President Trump just turned up the heat accusing the 44th president of treason. And Trump is just waiting for the right time to declassify the paper trail on Crossfire Hurricane.